Marx’s desire to transform society into a “free association of producers” has long been ignored by large swathes of the left. Not only Stalinists and social democrats, but also supposedly Trotskyist organisations such as the Militant Tendency have equated nationalisation with socialism, with the state bureaucracy substituted for the working class as the vanguard of social transformation. Sometimes gestures are made towards democracy through formulations such as “public ownership”, but the dominant trend of the left in recent decades has been to move further than ever from the perspective of workers’ management of the economy, with the Socialist Workers Party having abandoned their former commitment to “workers’ control and international socialism”. To avoid perpetuating the culture of “top-down” socialist planning it is necessary to promote an alternative vision of workers’ power – that of grassroots control. 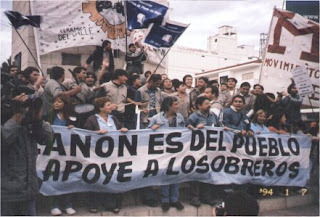 A new contribution to this important task is Pete Burton’s Workers’ Control blog (www.workerscontrol.blogspot.com) which features discussion of worker-managed businesses in Argentina like FaSinPat/Zanon and the Hotel Bauen, a film about the Sanitarios Maracay in Venezuela, as well as articles from across the twentieth century featuring different conceptions of workers’ control. The opportunity to compare the varied ideas of what workers’ control actually means is the strongest point of the new website. Over the years the lack of even the most basic consensus here has been remarkable. The Zanon workers operate their factory under their own steam, with decisions made by a democratic assembly of all its workers (who are all paid the same basic rate plus experience bonuses) - a method sharply counterposed to that exhibited in texts like Jaroslav Vanek’s 1975 collection Self Management, which does not distinguish between trade union supervision of the bosses, a market system based on undemocratic co-operatives, or the deeply hierarchical Yugoslav system where votes were staged for workers to give their assent to management plans. The problem in such conceptions is that all of them leave ownership rights and decision-making powers entirely in the hands of bosses and unaccountable state bureaucrats, with workers offered a limited ability to voice criticism but no right to take any initiative for themselves or subjugate specialists to their own authority. The creation of organs of economic dual power such as factory committees and workers’ councils is proposed as the means by which workers’ management can ultimately be achieved. This is the key point for Marxists – rather than looking to build islands of socialism within a capitalist economy, extend trade union involvement in management boards or merely see workers’ control as veto power over the bosses, the task is to fight for industrial democracy and workers’ rights in the here and now in preparation for direct workers’ management of the economy – for participatory and democratic working-class rule – in a socialist society. Thank you for the new link. Nationalization is not socialist by itself, but a nationalized enterprise is easier to convert to socialism. As a postal worker , a bit history . Turn of the 20th century , early days of the trade unions and the Labour Party , much was being made of the demands for either nationalisation of the industries or municipialisation of them , yet the workers for the Post Office , already a state owned and government managed industry tried to explain that neither was the solution , after all they were the ones with the real experience of being owned by the State . Instead union activists within the Post Office were attracted to the workers control aspects of GDH Cole's Guild Socialism and until the days of the 60s and the Bullock Report on workers participation was hidden away on the dusky dank top shelf of libraries ,the Postal workers union had retained their demand for some sort of workers control . And even todays post strikes has an element of the struggle for the postal workers "informal" control of the work-place against managements demands for "flexibility" and removal of "Spanish practices"
Instead of going forward with such demands we now have calls for re-nationalisation . Or calls to battles to halt privatisation . Сейчас очень модно ставить на окна рольставни : http://still-stroy.com/rolstavni . Более того некоторые даже умудряются их в туалетах ставить, аля чтобы доступ к трубам был.